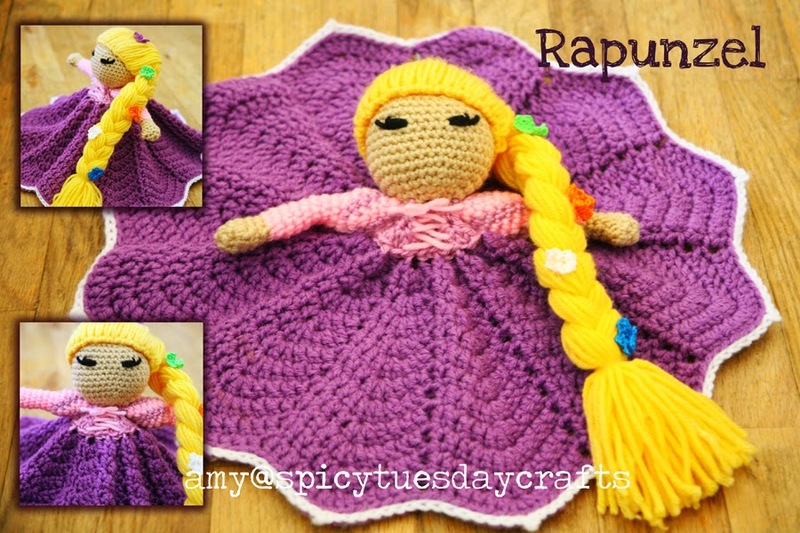 spicy tuesday crafts: More notes for the Princess collection - Rapunzel, Jasmine, and Pocahontas! More notes for the Princess collection - Rapunzel, Jasmine, and Pocahontas! Here's round three! These work up so fast...I'm totally hooked on them at the moment. I can finish one in about 2 evenings and between chasing after my babysitting buddies during the day. Their heads/hair take the longest for me, but I rip right through the dress/blankie part. 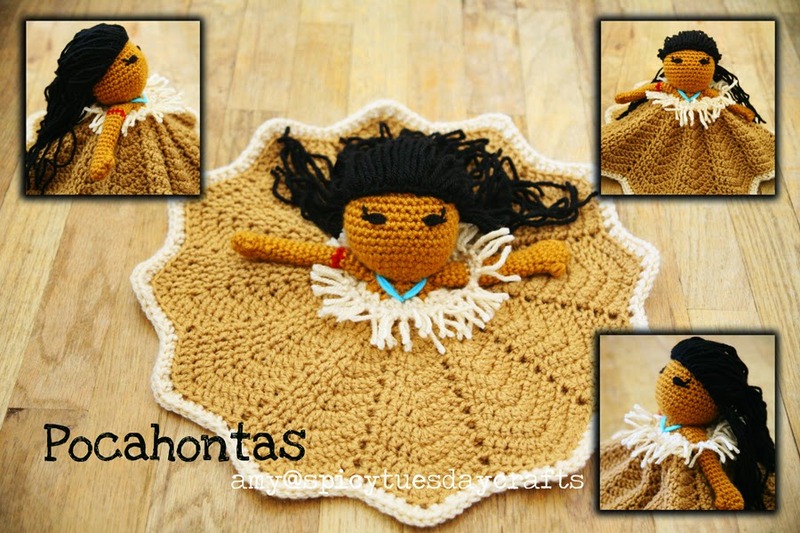 And coming soon I have Ariel and Lilo (in her hula outfit, from Lilo & Stitch) ready to show you. Stay tuned! And as always, you can purchase the base pattern for these Loveys here. Dress - follow bodice instructions then blanket instructions as written. Embroider the lacing in Pink after the dress is all finished. Using white, sl st along the bottom hem of dress - in BLO, on each "point" work (sl st, ch1, sl st) in the middle dc of each point around. Arms (make 2) - Make arm pattern as written for long sleeves (in Buff and Pink) until R13. R15-R19 - Alternating colors every 2 sts, work 1sc in ea st around. Colors should end up in a slight swirl pattern. FO, stuff and sew to R1 of the dress. - Cut hair pieces 20in long. Cut enough so that you can put one hair strand into ea st around the edge of the wig cap (36 stitches worth). Use the Latch Hook hair pattern to attach the hair. Braid hair pieces. - Add flowers - crochet small flowers and sew them randomly over the braid. - Using embroidery floss and a B hook, pick your favorite flower pattern and make a bunch of small flowers. - Sew the flowers in random intervals all over the surface of the braid. R14 - sw to Beige, work as written in BLO. Sew wig cap to head. Cut 12in pieces of hair and attach aroudn the whole bottom edge of wig cap, using the Latch Hook hair pattern. Fill in some more hair on the wig cap to make it look as full as you like. Gather up the top half of the hair into a low half-ponytail and secure with an elastic. Trim to clean up the ends. Fringe - Using Beige, attach yarn at back of dress at R4 in the front loops you left open (by working R4 in BLO). Work1hdc in ea loop around the front of the dress. When you get to the left arm, work 1hdc in the 4 loops across the front to the left arm. Continue working 1hdc on the dress around to the back where you attached the yarn. FO. Cut a whole pile of 8in pieces of yarn in Beige. Fold in half and attach 1 piece in ea st around the entire row you just added. Secure tightly and trim to a similar length all around. Necklace -Using Turqua, attach yarn from the underside of the dress at the top of the left arm. Sew a "V" shape down to the middle of the front of the dress just above the Beige row, then back up to the top of the right arm. FO underneath the dress. R19 - 1sc in ea st around (9). FO. Hair - Make wig cap in Black. Sew to head. Cut lots of 18in hair pieces. Use Latch Hook hair pattern to attach 1 strand of hair to ea sc around the bottom edge of the wig cap. Starting at middle of front, gather the left side of hair and twist lightly as you bring it to the back of the head. Repeat with hair on the right side. Put an elastic band on hair in a low ponytail. Add another elastic about 2in lower. Add the 3rd elastic band about 2in lower than that. Trim ends of the whole ponytail into a point. Headband - In Jade, ch17, turn. - 1hdc in ea st across. FO. Sew across top of wig cap. - Jewel - R1 - with Cobalt, make magic loop, 6sc in loop, join to 1st sc. R2 - sw to Gold, 2sc in ea st around, FO. Sew jewel on to center of headband. Embroider earrings in Gold on each side of head just under the hair. 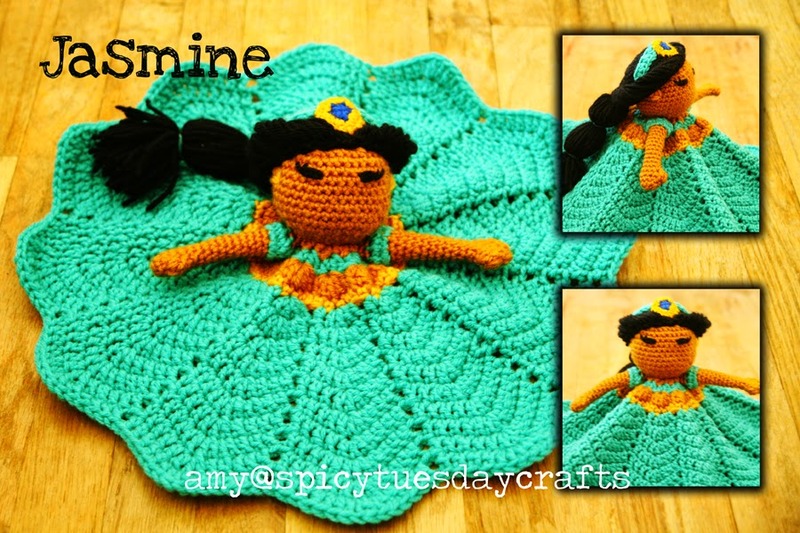 I absolutely love your "D" princess variations of this lovey pattern! Thank you so much for sharing these notes with us for free!!! I look forward to seeing your Ariel, but especially Lilo in her hula outfit! Any word on when the ariel and Lilo will be posted? I love these!!! Mary, I'm almost done with Ariel, then Lilo will be right after. Also, I've had requests for Disney Villains, specifically Maleficent, so those will be soon to follow! Thanks so much...happy you like them!! I love these dolls. I purchased the pattern and am going to get busy making your variations. Thank you for sharing! I love these sweet little dolls. I bought the base pattern and am just about finished with Tinkerbell, my first try. Can you offer any hints or tips as to sewing the head onto the blanket? I am not a sewer and I am so scared I will mess it up! Thank you for graciously sharing your patterns with us. I see a whole set being done for my granddaughter for the holiday! Love these patterns! Thank you so much for sharing! Hi there! Found all of the Disney patterns a couple of weeks ago, and fell in love! I just have a question about Jasmine's hair.